The health benefits of carrot juice have been well documented. 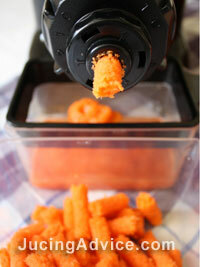 Carrots are a nutritional powerhouse, and juicing them releases much of their therapeutic power. Carrots were originally grown in the Mediterranean, and the ancient Greeks drank the juice to treat constipation, exhaustion and for its natural cleansing effects. Now, we know that carrots contain more beta-carotene than any other vegetable. Beta-carotene is converted in our bodies into Vitamin A. Vitamin A is an essential vitamin, and it has numerous functions. It keeps our eyesight sharp, boosts our immune system, makes our teeth and bones stronger and helps our thyroid glands function properly. Vitamin A also keeps our nails, skin and hair strong and healthy, and helps to cleanse fat and other unwanted elements from our liver. 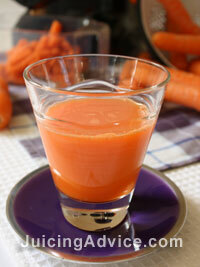 One of the benefits of carrot juice is carotene which is well known as a powerful anti-oxidant. Because carrots are packed with it, carrot juice helps prevent and treat inflammation and degenerative processes in the cells that we all experience as we age. For that reason, carrot juice has become a well-known anti-aging tonic. As if that were not enough, carrot juice also has antiseptic and anti-bacterial properties, and can be dabbed on insect bites and small cuts to relieve pain and swelling. Carrot juice packs a lot more additional nutrition in a small package. When you drink a glass of carrot juice, you are also getting a healthy dose of Vitamin B, C, D, E and K along with potassium, calcium, zinc, manganese, phosphorous, iron, copper and a whole host of other important minerals that we need. You will also get a dose of nicotinic acid, which will help you metabolize fats, and magnesium, which will lower the amount of ‘bad’ cholesterol in your body and keep your blood vessels strong and healthy. The natural benefits of carrot juice can be made even more powerful by mixing it with other vegetables and fruits. Adding spinach, for example, to your carrot juice will boost its cleansing effects and also help you relax and sleep better. Combining carrot juice with beetroot juice, citrus fruit juice or berries will give you a powerful dose of Vitamin C, perfect when cold and flu season rolls around!